Add RFX5 polyclonal antibody - Classic to my shopping cart. Request a quote for a bulk order for RFX5 polyclonal antibody - Classic. Please fill out the form here below. Your local sales account manager will get in touch with you shortly and send you a quotation based on your requirements. 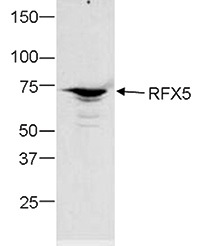 Polyclonal antibody raised in rabbit against RFX5 (Regulatory Factor X 5), using a KLH conjugated synthetic peptide from the central part of the protein. Nuclear extracts from Raji B cells (35 μg) were analysed by Western blot using the Diagenode antibody against RFX (Cat. No. C15410326) diluted 2,500. The position of the protein of interest (expected MW 80 kDa) is indicated on the right; the marker (in kDa) is shown on the left. RFX5 (UniProt/Swiss-Prot entry P48382) binds to the X box of MHC-II promoters thereby activating transcription, and mediates the cooperative binding between RFX and NFY. Deficiency of RFX5 leads to a lack of MHC-II expression which is characterized by a severe immunodeficiency syndrome called MHC-II deficiency. Diagenode strongly recommends using this:	RFX5 polyclonal antibody - Classic (Diagenode Cat# C15410326 Lot# 001). Click here to copy to clipboard.